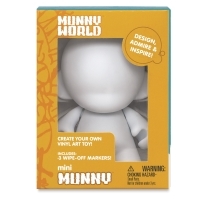 Think of Munny as your blank, 3-D canvas! Featuring the same great design as the original Munny, these vinyl figures are meant to be customized with paints, markers, pens, and other art supplies. What's more, if you use the included wipe-off markers, you can wipe your Reusable Munny clean, then tweak and change your design again and again! 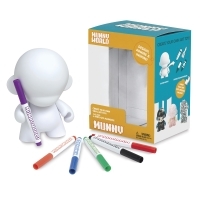 The Munny and Mini Munny are great companions for the studio, classroom, or home. Both sizes come with reusable markers. The 4" Mini Munny includes three reusable markers. The 7" Munny includes six reusable markers. ™ Kidrobot is a trademark.™ Munny is a trademark.